I may have gotten a little ahead of myself by blogging about a Monochromatic painting before I introduced the color wheel concept. 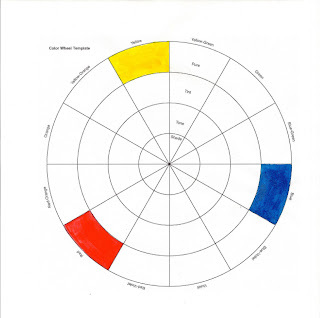 So before we go any further with our exercises, I think it would be very helpful to go through the exercise of creating a color wheel. You can find some good and useful templates online, just google colorwheel template , choose one and print it out. The first step is to prepare your palette with 3 colors. These will be the 3 Primary colors or "Hue's". Primary colors are the 3 colors that cannot be created by mixing. They are Red, Yellow & Blue. All other colors are created from these primary colors. Three primary colors that are good to use for the exercise are Napthol Red, Hansa Yellow and Ultramarine Blue. Begin by painting 3 evenly spaced blocks with the 3 primary colors: see figure below. Next paint 3 more blocks with the Secondary colors. Which are equal parts of primary colors mixed with each other. Equal parts of Red mixed with Yellow will create Orange. Yellow mixed with Blue will create Green. Blue mixed with Red will create Purple or called Violet. Next we will create the "Tertiary" colors on the wheel. These colors are created by mixing equal parts of the colors on either side of them. Red mixed with Orange creates Red/Orange. Red mixed with Purple creates Red/Purple (violet). Yellow mixed with Green creates Yellow/Green. Yellow mixed with Orange creates Yellow/Orange. Blue mixed with Green creates Blue/Green. Blue mixed with Purple creates Blue/Purple (or Blue/Violet). This completes the basic color wheel. Now, the next step in this process is to mix each of the colors that are on the wheel with white (tint), gray (tone) and black (shade). Take a hue, red for instance, and mix some white with it, and then paint the block under red. Then take red and mix gray with it and paint the next block under red. Then take red and mix black with it and paint the last tiny block under red. do this with all the colors: Red, Yellow, Blue, Orange, Green, Purple, Red/Orange, Red/Purple (violet), Yellow, Yellow/Orange, Yellow/Green, Blue/Green, and Blue/Purple (Violet). This really shows a variety of options that are available within a Hue category. 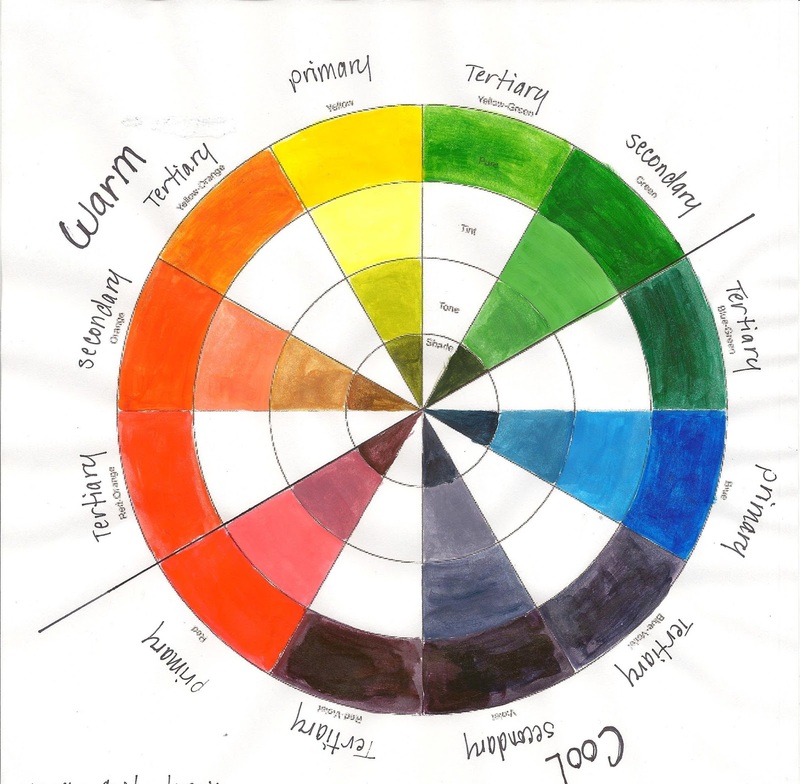 I didn't finish my color wheel so that you could see the variations better. Finally, when you are finished painting the wheel, go ahead and label it. You could even add the color names of the Primary Hues (which I didn't do). Exercise #2 completed. Thanks for walking through it with me.